For Week Nine of the 2017 Oregon high school football season, here's a look back at the Plays of the Day. To see complete game stories from all these contests, go to the Prep Football tab. 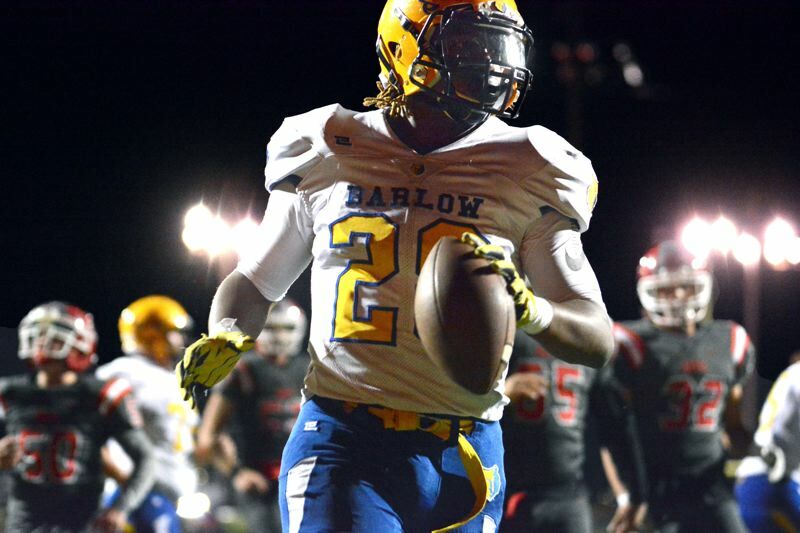 BARLOW 53, DAVID DOUGLAS 22: Barlow running back Jobi Malary scored on an 11-yard run through the middle and would return with an 8-yard score a few minutes later to put the Bruins in charge 46-14 midway through the third quarter of their Friday game against David Douglas. TIGARD 28, TUALATIN 6: On the very first play following a 1 hour and 55-minute delay — and a change of venue — Tigard High School senior running back Jake Leavitt powered his way into the end zone from a yard out, giving the Tigers a 7-0 lead over the Timberwolves with 4:57 remaining in the first quarter of the game that started at Tigard High School and was moved to Tualatin High School due to a power outage at Tigard. SANDY 42, ST. HELENS 18: Sandy senior quarterback Tyler King and senior running back Nolan Turin found each other once in the first quarter and again in the fourth to help Sandy surge through its Northwest Oregon Conference rivalry finale with St. Helens. King and Turin's 21- and seven-yard touchdown passes came as the Pioneers never trailed in a 42-18 road win at Doc Ackerson Stadium. CENTRAL CATHOLIC 58, GRESHAM 7: Central Catholic running back Miles Jackson broke free for a 40-yard touchdown run that put the Rams in front 20-0 midway through the second quarter of their Friday win over Gresham. 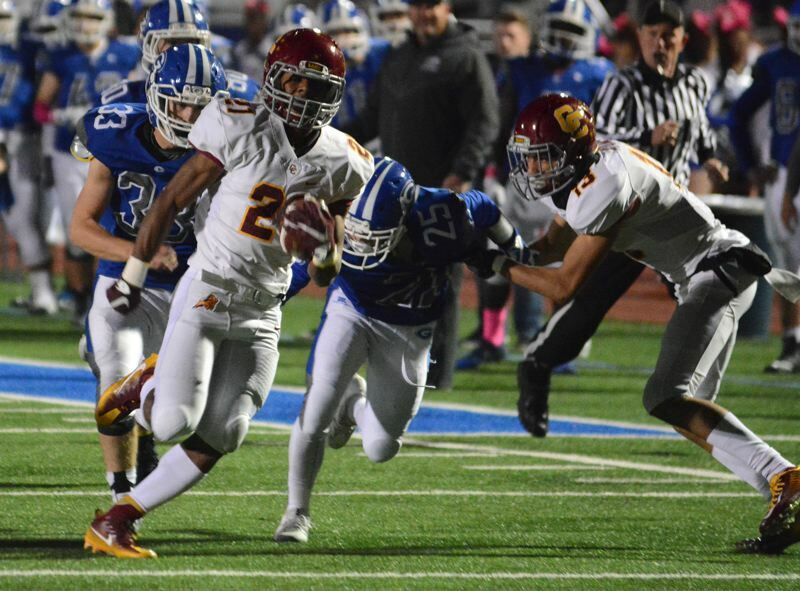 JESUIT 48, WESTVIEW 0: Leading 14-0 in the first quarter, Jesuit junior cornerback Josh Daul deflected a pass from Westview quarterback Cielo Del Rosario into the air, which Briceton Branch plucked out of the sky and raced back to the end zone to make it 21-0 on Friday. WESTON-MCEWEN 22, CULVER 6: Facing a fourth-and-25 from the Culver 45-yard line, Weston-McEwen called a high-risk, high-reward play. Senior quarterback Brett Speed orchestrated a hook and ladder, in which Parker Munch caught Speed's pass, then lateraled to Jacob Speed, who picked the ball off the ground and outran the Culver defense for a touchdown. After the ensuing two-point conversion, Weston-McEwen led Culver 16-6 halfway into Friday's third quarter. ESTACADA 30 ASTORIA 14: The Estacada offense struggled for the entire first half of its Friday game against Astoria, but that all changed on its first drive of the third quarter. Rangers running back Wyatt Riedel got the direct snap from center and scampered 34 yards for the first score of Estacada's Class 4A Play-In victory. SWEET HOME 52, CROOK COUNTY 6: Sweet Home quarterback Colton Smith had already thrown three touchdown passes in the first half, and when Crook County fumbled, Smith quickly went to work, hitting Jake Swanson in the corner of the end zone on an 18-yard strike, for his fourth touchdown pass of the half. The touchdown gave Sweet Home a 32-0 lead and put the game out of reach. WEST LINN 49, CANBY 7: Following a Canby punt, West Linn junior quarterback Ethan Long connected with sophomore wide receiver Casey Tawa on a 19-yard pass for the Lions' second touchdown of the night with 5:00 left in the first quarter of their Friday win at Canby. LAKE OSWEGO 35, LAKERIDGE 6: His team already leading Lakeridge 7-0 in Friday's Battle of the Lake game at Lakeridge High School, Lake Oswego senior Jordan Newlin made it 14-0 in a heartbeat. 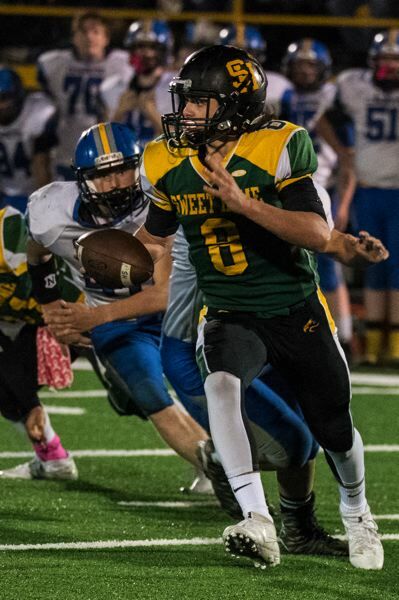 Newlin fielded a Joe Marini punt at the Laker 15-yard line, sped upfield for 10 yards, then cut to the left sideline and outran the Pacer defense for an 85-yard touchdown just 5 minutes and 17 seconds into the contest.